I replied, telling him that’s a great idea, and others agreed. I then went on a bike ride. On the road to Dunston – Damascus being too far for a hill-climb quickie – I had a light-bulb moment: jerseys with tax discs printed on them. And arm-warmers, so cyclists thrown the ‘we pay road tax’ argument can counter by simply pointing to an upper-arm. It’s sure easier than getting a tattoo. When I got back from the ride I registered iPayRoadTax.com and iPayRoadTax.co.uk. I commissioned Luke Scheybeler to produce the fake tax disc above. This will be used on the jerseys and arm-warmers. For product updates, follow iPayRoadTax on Twitter. The fonts and colours for the jersey and arm-warmers aren’t set in stone. Others on Twitter suggested headset spacers and topcaps, too. Oy, could do loads of things. Like mugs, badges, t-shirts? 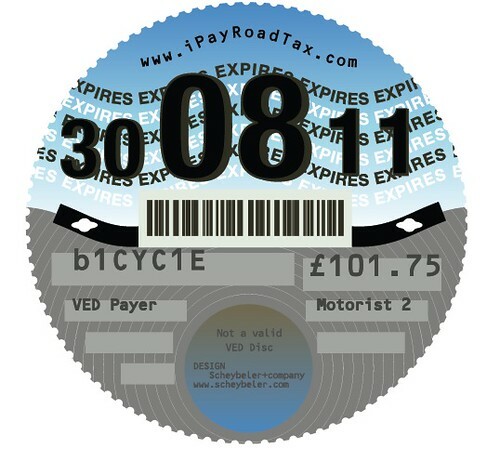 Or how about, ahem, a tax-disc holder for your car, emblazoned with bicycle symbols? When I twittered the fact I’d registered a domain-name and who would like some arm-warmers and jerseys, the response from Twitterdom was immediate. Within seconds I got firm orders. Really. Seconds. Amazing. From inspiration to product idea to mock-up to orders within minutes. Who says Twitter is a waste of time and thence money? I may have just created a micro-business thanks to picking up on a 140-character message. If you’d like to express interest in items from the forthcoming I Pay Road Tax collection, have a look at this. NB Road tax was abolished in the UK in 1936. Since then we have paid ‘Vehicle Excise Duty’ and, as every fule knows (except the majority of motorists, it seems), this does not pay for the upkeep of roads. This comes out of general taxation. Cyclists are tax-payers…And, of course, the majority of adult cyclists also own cars so pay VED, too. It’s just that many cyclists prefer not to use their cars for every blummin’ short journey. 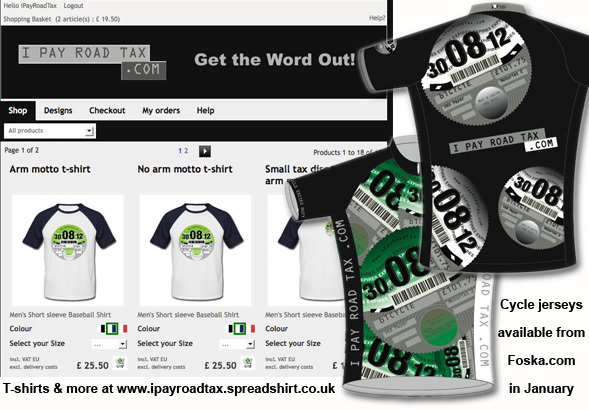 To help spread the iPayRoadTax.com message there’s a bunch of Spreadshirt-made badges, t-shirts, wickable base-layers and a messenger bag, all featuring iPayRoadTax.com graphics. A variety of bespoke, cycle-specific jerseys, arm-warmers, water bottles and other accessories will soon available to pre-order via Foska.com soon. Originally, the way to pre-order was to send an email expressing interest but so many were sent it became clear a retail partner was needed. 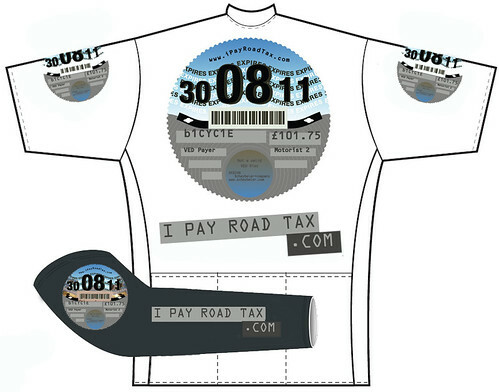 The cycle clothing – similar to the jersey examples above – will likely be available in late January, although Foska.com can log your details once the iPayRoadtax.com designs have been added. Sign up for the Foska newsletter via ‘SafeUnscribe’. This entry was posted on Tuesday, November 17th, 2009 at 6:19 pm	and is filed under Launch. You can follow any responses to this entry through the RSS 2.0 feed.